Kabocha squash aside, today is the stage for the fancy squash spaghetti, or spaghetti squash. Compared to kabocha squash or butternut squash, spaghetti squash is relatively quite a bland squash. Personally, I think this squash can be a great alternative to a root vegetable such as turnip or jicama for texture when called for in recipes. 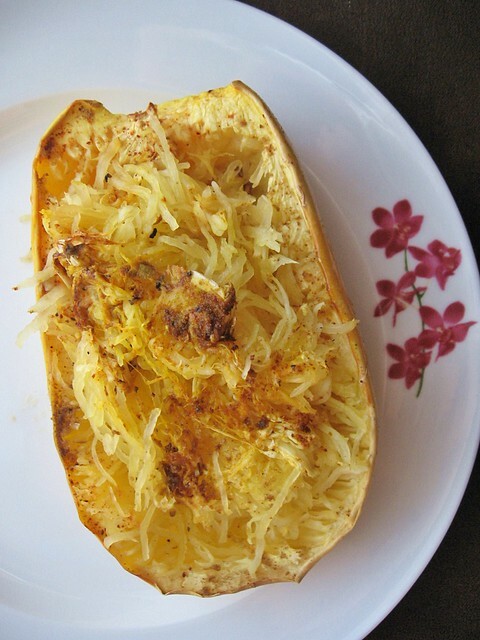 In addition, the best thing about roasted spaghetti squash is, when roasted or cooked, you practically (and instantly) have "julienned vegetables" just by scraping the squash using a fork. Directions: Preheat oven to 375F. Season the cut surface with spices. Roast cut-side up for 1 hour. When cooled, gently scrape and fluff the squash using a fork and you get the strands of squash to use (e.g. Easy Squash Fritters or perhaps let's call it Easy Squash Muffins) or enjoy. 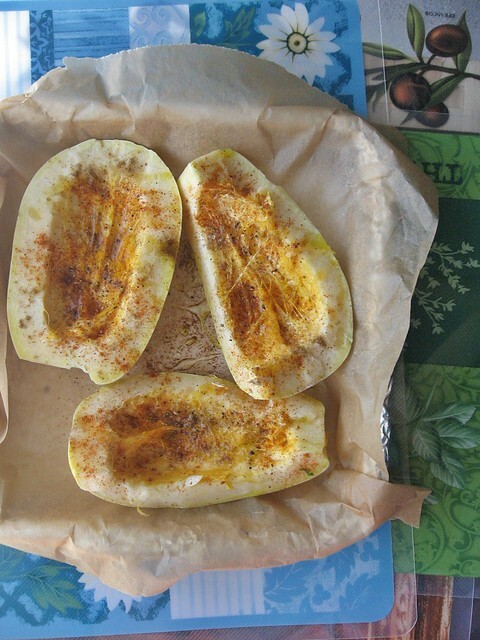 When seasoned and roasted, the squash can simply be enjoyed as a side-vegetable-dish with entree such as baked fish e.g. Herb-Roasted Whole Trout or roasted chicken. The leftover squash can also be used for making frittata or as "noodles" substitute (or fillings for spring rolls).